Traditional all built up construction sheeted in ply. Pat purchased this model as a part completed project with some issues !! The is currently improving the airframe prior to completing it ready for flight. 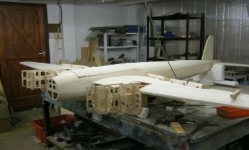 2 x 1/5th scale Mosquito's are being built by John and Tony to a design originally produced by Ivan Goodchild for electric power. John has modified the design for Petrol power and construction is well underway. This is quite an old model that Darren started prior to joining the team but which was never finished. The Mosquito project seemed an ideal opportunity to finish the model so it could be flown alongside the Mosquitoes in a unique display.